← Parma Number 31: Waterloo Hotel … Shame about those cheese rations! The Verdict: I was a little bit worried when the Parma Consigliere, Davo (the Junior Parma reviewer) and I walked into the Red Brick because it was empty. I needn’t have worried because this Chicken Parmigiana was really very good. Indeed, but for the ham which was cubed and a bit tasteless, this parma may well have challenged the current front runner for the “Robert” Parma. Chicken: What a great “start” to this meal. The chicken piece was well crumbed and perfectly cooked. The chicken was moist and tasted great. Tomato Sauce: The tomato sauce on the Red Brick Hotel Parma was just spot on. It covered the chicken piece and was very tasty. It complemented the chicken and cheese on this meal perfectly. Ham: In what was a very good chicken parma the ham was the only major disappointment. The reason for this will be obvious to regular readers from a brief perusal of the picture above. The ham was cubed. In concert with this the ham was just a bit tasteless. Cheese: If the ham was a significant disappointment, the cheese was a revelation. The cheese covered the chicken piece, was perfectly melted and tasted great. Enough said! Side Dishes: During this quest to find Brisbane’s Best Parma it would be fair to say that one of the areas where there has been the biggest variance in quality has been in the salad. I can say without reservation that the salad with the Red Brick Hotel Parma is the best salad I have had so far. It was well put together, was fresh and dressed well. I can not fault it. The chips were, despite being entirely covered by the chicken piece, also quite good. They were well salted and crisp. Presentation: Queue the broken record: the plate was quite small and the chips covered the salad. I repeat: enough said! The Venue: The Red Brick Hotel is in Woollongabba near the Children’s Hospital. It is another of Brisbane’s grand old venues that has undergone a refit in recent years. We tested the chicken parma on a Monday so it was, to be honest, empty but I can imagine that, with a quality TAB facility I can imagine it being quite busy on the weekend and Thursday night. My parma cost $18 and there is a parma night on a Thursday night which gets your parma cost down to $10. The Final Word: The Red Brick Hotel Chicken Parma has rocketed into the Top 5 in the race for the “Robert” Parma off the back of a great salad and three out of four of the elements of the chicken being out of the top drawer. The cubed ham was a real let down. Walking in to the Red Brick Hotel the first thing I noticed was that it was really quiet and I said to Uncle Steve, “oh this place is really quiet we might get our food really quick” and Uncle Steve (The Parma Guy) said, “yes maybe”. The good news was that this hotel has a Parma on its menu so we went straight up to order. This Parma was the highlight of my day as the chicken was succulent and there was the right amount of cheese on it but the sad news is that the Parma was on top of the chips and the ham was not a slice they were cubes. The chips were amazing and they were cooked for the right amount of time. The salad was the best one I’ve ever had with a Parma but the dressing was very sweet. This entry was posted in Uncategorized and tagged Brisbane, brisbane food, brisbane's best, chicken, chicken parmigiana, Junior Parma Reviewer, Red Brick Hotel. Bookmark the permalink. I only found your blog today, wish I had seen it as it happened. My friends and I love a good Parma! I use to work at the red brick hotel and I found it funny that you thought it might get busier. It doesn’t … unless there is a function. 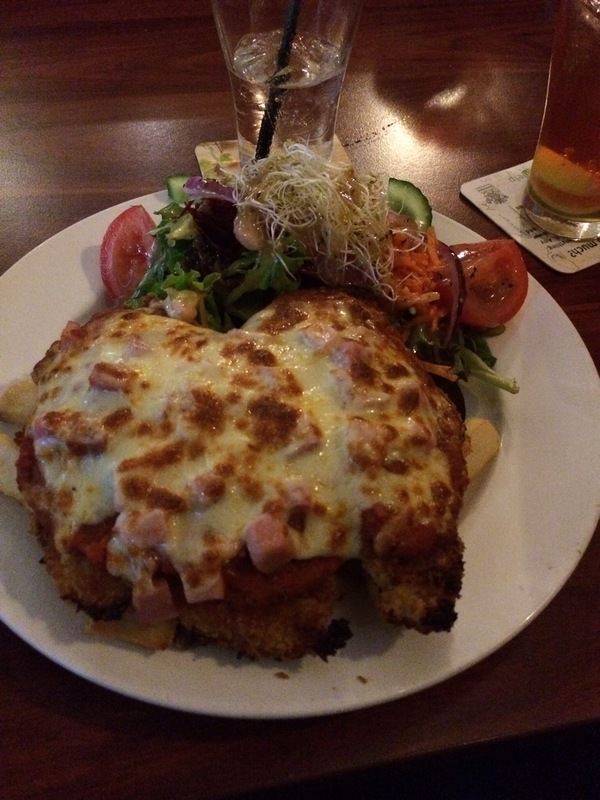 However, I always recommended the Parmy (parma/parmi/whatever) when I was there because they were so good! But I have never seen it served with cubed ham before. Super weird. The Red Brick has gone through a few chef changes since I worked there and this may have something to do with it. They also use to do a few variations on the classic that were pretty good too!